Tennis Podcast listeners will be familiar with the attempts of David Law and Catherine Whitaker to predict tournament winners, match outcomes and just about anything and everything within the world of tennis, often unsuccessfully. Since 2017, a number of brave, generous listeners have backed our Kickstarter campaign to get the opportunity to challenge Catherine, David Law, the rest of the pod team and fellow backers in our annual predictions competition. Grand Slam quarterfinalists, semifinalists and finalists are picked, as are year-end rankings and Davis/Fed Cup champions (see 2017 example below). Meticulous mathematicians then calculate the scores using a dedicated and complicated statistical matrix. At the end of the year, the overall winner is announced at our Live Show and on our social media media channels, earning bragging rights for a full year. 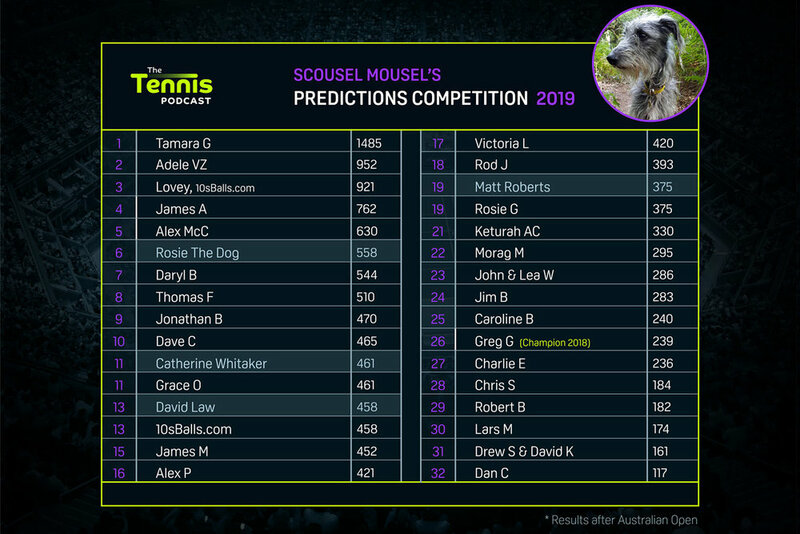 In 2019, the predictions competition has a title sponsor - Scousel Mousel, a gorgeous dog owned by a very special listener.